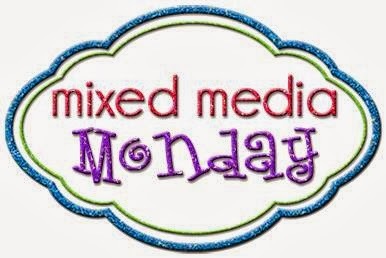 Hello, welcome to Mixed Media Monday with me, Ann, and my inspiration for the Linky Party over at the All That Stickles blog. This is my two page spread in that awesome art journal I like to carry around and produce some of my favourite examples. In wanting to make something inspirational and in tune with the ongoing theme at the All That Stickles Blog, where I am on the Design team, I made this. My ode to "Think Pink". 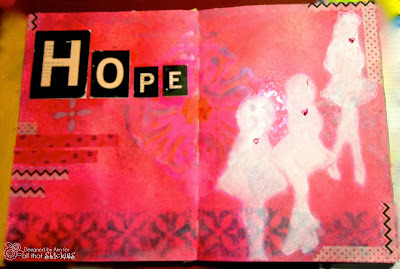 So many of us are affecdted by cancer and sometimes all seems so dark and all thewre is left is Hope. That is what I wanted to convey her. We hope that the future will be better, and that there is a cure around the corner. We hope that those affected and their loved ones have strength to see them through these challenges. I started this layout with gesso, acrylic paints (mostly craft) then followed with a mixture of sprays. There are Dye ink sprays and Alcohol based ink sprays from Ranger and Tattered Angels. Most of them have some shimmer added to them either already or with additional pigments(Perfect Pearls). There is stamping with Ranger inks, stencilling (Home decor stencils from my stash) and more inks and paints. The girl figures are silhouettes made in pastel chalk and gel inks. I cut out masks made from traced images of Prima Doll Stamps. I painted the hearts on each figure with Pink "Stickles" (Ranger). The Letters are stickers (Pink Paislee) and there are washi tapes (Various types from my stash). I hope that you are inspired to make somethinh Pink and share it with the viewers at the ATS blog. Thank you for visiting today.